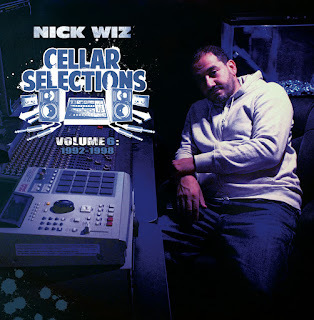 By popular demand, we are back with the part 6 in this long running series - collecting 22 more tracks produced by NJ's Nick Wiz between 1992 and 1998, and featuring artists such as Ran Reed, Cella Dwellas, Hardwe're, Pudgee, Shadowz In Da Dark, Chino XL etc. Includes 2 songs previously unreleased! The vinyl comes in a white sleeve with an oversize sticker. 100 copies are on colour vinyl (1 disc clear purple / 1 disc clear gold) and 200 copies are on black vinyl. The vinyl is pressed and in stock now - orders will be shipped over the next few weeks. - When your order is shipped, I will update the shipping information in PayPal (with tracking info where relevant). - All international orders are marked as a gift with a low customs value - if you have any special requests with regards to shipping please let me know and I will try to help. - There isn't a new vinyl release on Heavy Jewelz this time around, but if you missed any of their previous releases (most of which are close to selling out/already sold out) and want to get something from their store you can combine orders to lower shipping costs, just leave a note when you checkout so that I know to combine your order.